We’ve left our spot and are pulling into the station of Mount Vernon. There has been a report of no fatalities! Yaaa! The Amtrak Crew has been absolutely great, they’ve even brought us extra snacks to tide us over. ETA into Vancouver is now about 12:30… but being the railroad is practically shut down we’ll see. We finally arrived at Pacific Union Station in Vancouver. That was a trip and a half! As it stands now the I-5 Bridge over the Skagit River has collapsed with vehicles, people and the bridge plunging into the river. No news or anything on fatalities, injuries or the like. However one thing is very clear for this train riding individual. Amtrak Cascades #516 is sitting about a mile south of Mount Vernon with about 200 passengers that can’t get on or off the train (because of laws & such) and can’t get off at Mount Vernon. From what I gather and have been informed of by the Amtrak staff (they’ve been great) is that the railroad bridge is being inspected. Through other means, passengers calling other connected people and via contacts of my own I’ve collected this much information. The NTSB I have been informed is on the way. BNSF Dispatch (that thing in Texas) has held us here while the railroad bridge is inspected. Nobody seems to know who is actually inspecting the railroad bridge. 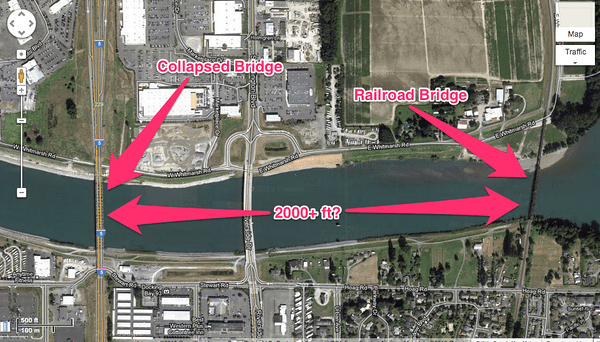 WSDOT thinks a truck – oversized load (probably something that should have been on the railroad) hit the bridge and caused it to collapse. However this is not entirely confirmed. People & cars are in the river. Boats & rescue is underway. …and here’s where they (BNSF/WSDOT??) forced the train to stop. 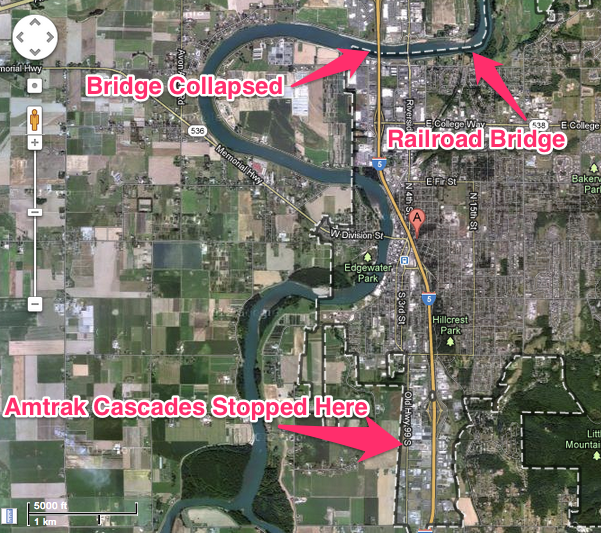 Where Amtrak Cascades 516 has been forced to stop. Love how the passenger rail, as always gets creamed while they’re re-routing cars onto redundant infrastructure. It’s a good thing they provide all those massive hand outs to auto drivers and stop the trains so nobody gets confused about where the US’s priorities are. Very interesting… hope you get some sleep tonight! Are you actually moving now at 12:24 am? Just arrived around 12:45. Got to the hotel about an hour later at 1:45. Well this stinks. After previously reporting a new round trip between Bellingham and Seattle because of the bridge collapse last month, they have indeed added Train 517 northbound but according to Amtrak customer service this afternoon (Wed 19 June), they have cancelled Train 515. Stinks because we booked 515. The new train 517 arrives too late for an appointment in Seattle that night.